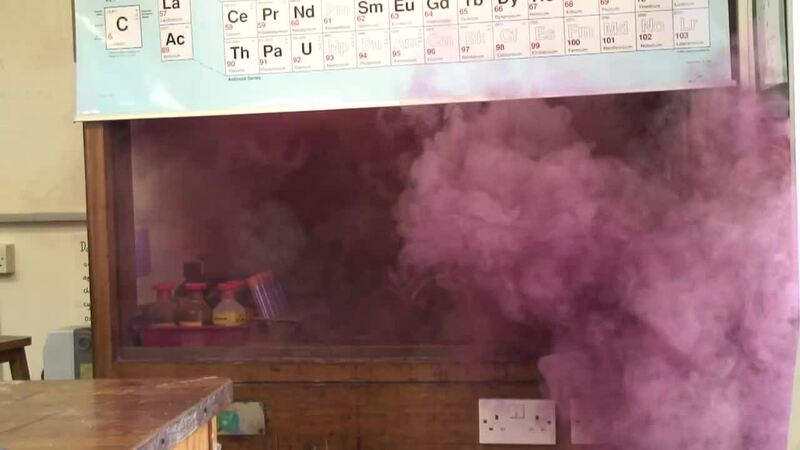 The nitrogen triiodide demonstration produces a loud sound and a cloud of purple vapor. The nitrogen triiodide chemistry demonstration is a dramatic explosive reaction that produces sound and colored vapor. Crystals of iodine react with concentrated ammonia to precipitate nitrogen triiodide (NI3). The NI3 is then filtered out. 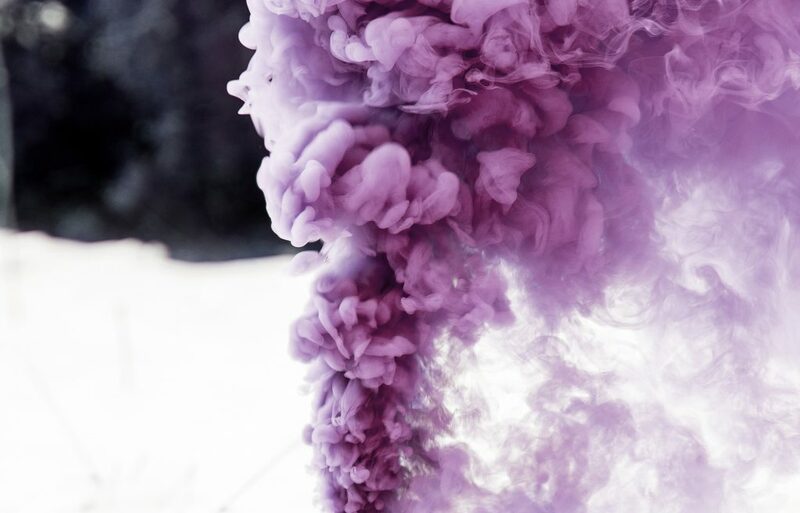 When dry, the compound is so unstable that the slightest contact causes it to decompose into nitrogen gas and iodine vapor, producing a very loud “snap” and a cloud of purple iodine vapor. You want to avoid handling the NI3 at all, so set up the demonstration before pouring off the ammonia. Traditionally, the demonstration uses a ring stand on which a filter paper of damp NI3 sits above a second filter paper of damp NI3. The force of the decomposition reaction on one paper causes decomposition to occur on the other paper as well. To activate the decomposition, tickle the dry NI3 solid with a feather attached to a long stick. A meter stick is a good choice (don’t use anything shorter). You can also perform the demonstration simply by pouring the damp solid onto a paper towel in a fume hood, letting it dry, and activating it with a meter stick. 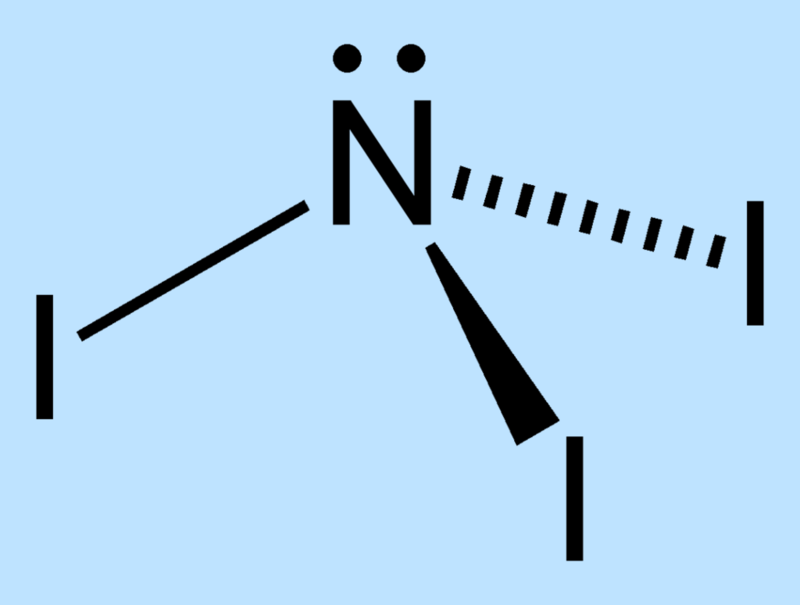 NI3 is highly unstable because of the size difference between the nitrogen and iodine atoms. There is not enough room around the central nitrogen to keep the iodine atoms stable. The bonds between the nuclei are under stress and therefore weakened. The outside electrons of the iodine atoms are forced into close proximity, which increases the instability of the molecule. Caution: This demonstration should only be performed by a trained instructor, using proper safety precautions. Wet NI3 is more stable than the dry compound, but still should be handled with care. Iodine will stain clothing and surfaces purple or orange. The stain can be removed using a sodium thiosulfate solution. Eye and ear protection are recommended. Iodine is a respiratory and eye irritant; the decomposition reaction is loud. Ford, L. A.; Grundmeier, E. W. (1993). Chemical Magic. Dover. p. 76. ISBN 0-486-67628-5.